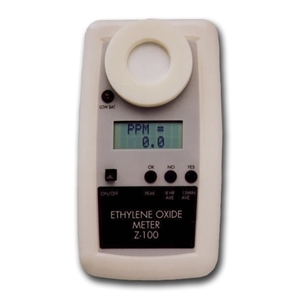 Environmental Sensor Co.’s Ethylene Oxide Meter is a hand held instrument that measures ethylene oxide vapor concentration with a range of 0-20 ppm and a resolution of 0.1 ppm. The instrument has an LCD display which shows the real time concentration in ppm (updated every ten seconds), a low battery indicator, and an audible alarm that can be set at any level 0.01-20.0 ppm. The meter can also display the Short Term Exposure Limit (a 15 minute average updated every 15 minutes), and the Time Weighted Average (an 8 hour average updated hourly).